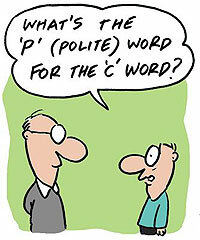 What’s your favourite 'C' word? I recently happened upon this post by Stibo Systems, offering five 'C's of Master Data Management: “Case”, “Content”, “Connecting”, “Cleansing”, “Controlling”. In some respects I can't really fault any of the issues highlighted by Stibo - they certainly all need to be addressed as part of any successful MDM implementation. But yet again, we have a product vendor offering a very technology-centric point of view. Maybe not surprising, but still disappointing and frustrating in equal measure. As I suggested in an earlier, post, it almost entirely ignores the human and societal factors of organisation, culture, process and human skills that will either make or break an MDM programme. One could possibly argue that these challenges are the prerogative of Data Governance, rather than MDM per se, so while I’d normally counter that the two are so inextricably linked as to make the distinction moot, I’ll go with it…. Communicate: A common lexicon is foundational. People need to talk to each other and understand each other. We all achieve more if we understand what others are doing, if they understand what we’re doing, and how our own tasks fit into the wider organizational context. It is not always necessarily for them to agree, but any differences in interpretation of data terms need to be explicitly identified and mindfully handled. Co-operate: no man is an island. Our work and the actions that we take will have an impact on those around us. At the very least, we shouldn’t be getting in each others way – we work for the same organization, after all! If there is data being generated within one department, then it needs to be made available to any other team who also can make use of it. To paraphrase my astute colleague and friend Meghan Vesey, “the attitude of POIM* is unacceptable and is not to be tolerated”. Collaborate: “Better together” is the current phrase being used within the “No” campaign for the Scottish independence referendum. Now, I’m not intending to get into the whys-and-wherefores of the Scottish independence debate. (As a Scot in exile, I don’t get to vote in the referendum anyway! For the sake of balance, here is the link to the "Yes" Campaign.) But I think the phrase neatly summarises a mindset where we go beyond simple co-existent tolerance and start proactively working together for shared benefit. Group-think can be a powerful enabler (as long as it doesn’t become just a gab-fest). Focus on action, target an outcome. Cajole: This could also have been “Coach”, but I went for cajole a) because it’s an under-used word and b) it conveys a sense of proactive encouragement, rather than simply providing support when it is wanted. We all need a catalyst every now and again to get us away from complacency and towards creativity (More 'C' words!). Giving each other a shake up every now and again can be helpful – innovation comes from being pushed. Do this for each other on a regular basis, and the benefit is mutual. Coerce: Yes, I’m going there. I am advocating that on occasion, you will need to manipulate people and bend them to your will. It’s a tool of last resort, but a carefully applied element of compulsion can break a deadlock, whether it’s in the form of a new policy, an applied standard, a new mandate or just simply an instruction to act in a particular way. Threats can be handy too, as long as you’re prepared to follow through! Force the issue, change the behaviour, drive the action, get a result. Alan, great post. I am in total agreement that the Change Management aspects of Data Governance are almost always overlooked because of the technical aspects. I would add another C-Word: "Challenge", by which I mean the team needs to challenge the status quo, and challenge the enterprise's beliefs. The changes that Data Governance bring to an enterprise are often uncomfortable, but require the change agents to challenge people to push beyond the known into the realms of "actually, we could do this better". Presuming the team does a great job with Communication, Co-operation, Colaboration, Cajoling, and Coercion, the outcome is going to require one more C-Word: Celebration. "Love it! I'd add one - Captivate, especially if you're in the early phases of a data governance programme. If you can't sell the concept by communicating clearly and concisely in a way that gets people wanting to join your campaign, then you're not going to get the chance to follow through on all the other C's!" Alan a, great piece. Let me add "Complete". Partial data governance makes no sense, and a partly finished project ... isn't! Thanks Ian. "Complete" is an interesting one. I think I'd conflate co-operate and collaborate and ..er.. commend: culture and challenge. For data governance to work in the long term, I realise that the Cs are a way to *get* to a culture change but I think that establishing the fact that it's a long term change rather than a project that'll end is an important step in its own right. And challenge because it's an uphill struggle at times and challenging our own ways of working are as important as challenging the old cultures we need to change. Thanks to Nigel - "Charm" & "Constant" added to the list. This also prompted me to think of "Consistency" which is subtly different, and also needed! On LinkedIn, Gary Alleman offered "chaos", which is what you get if you don't do anything. "I was looking for a 'C' word for 'educate', as I believe that is critical to a cultural (a 'C'!) change that is imperative to success - how about Campaign? Successes should be loudly celebrated (has that one been captured?). Thanks for the Friday grins..."
"Nicely summarized Alan. It's unfortunately common for software vendors to default to the technology perspective of an issue because it's comfortable and we offer implicit Credibility (another C to consider perhaps!). We've done it in our history (and will likely make the mistake again, athough we're actively avoiding it!). But with regards to data governance, I've been driving home the message you're sharing for the past few years (see my GovernYourData.com community for my POV) and one of the biggest "C" issues I'd recommend adding is "Change". Data governance requires and evangelizes changes to behavior, business processes, roles & responsibilities, org structures, systems, and yes, changes to data too. The final C I'd recommend considering is "Check" (a C-way to describe the measurement and monitoring required to baseline, maintain and communicate value from DG efforts). Thanks for the post!" Education certainly key - and "campaign" is probably closer to the reality! And "Check" is definitely foundational - you can't manage what you can't measure might be glib, but doesn't make it any less true. "Alan, I like your list of 5 C’s (Communicate, Co-operate, Collaborate, Cajole and Coerce) much better than Whitney Craven’s MDM list (Case, Content, Connecting, Cleansing, and Controlling). Even though I work for a product company specializing in information management technology, the secret to successful enterprise information management (EIM) is in tackling the business and organizational issues, not the technology challenges. Fundamentally, data management at the enterprise level is an agreement problem, not a technology problem. Here is my take at the 5 C's." Culture, Change, Capability, Commerce and Competency Center. "I'm really enjoying this thread and the ongoing compilation of C's. But something just hit me as pretty funny. We data governance evangelists promote business-first thinking and work hard to remove IT and data-centric blinders. But these threads are forcing "alphabet blinders" by limiting DG characteristics to the letter C! There are a finite number of useful words that start with the letter C, but an infinite number of characteristics that we could consider. I recommend we stop ignoring the other 24 letters of the alphabet that have been dismissed! (Yes 24, I personally think the letter V has had it's day in the sun already, right??)" I'm chuffed to have been part of the stimulus for John to write his own piece. Great stuff. Aside(2): bear in mind too, that I'm a Scotsman, which means that I was brought up with swearing as just a form of verbal punctuation. So I think I've done pretty well to keep it clean! "A few that come to my mind are Clarify, Catalogue (e.g. created a data dictionary), Contextualise and Congratulate (staff who look after their data well)." "It is tricky, and that's why, after all this time, data quality still doesn't get the involvement and the sponsorship that it deserves. Because it's actually really hard to make a subject like data (and it's controls and governance) interesting. But I firmly believe that it's my responsibility as a data governance practitioner to make it interesting, to generate that buzz, to get people wanting to do a data quality initiative. And let's face it, poor quality data is never the root cause - it's always people, processes, or technology - and people can get interested in them." "Couldn't agree more. MDM is a human-centric endeavor. Technology is just the facilitator. Leading with the facilitator is a sure recipe for unrealized ROI. The technology needs to fit the need, not the other way around. I especially take exception to the last step, "Controlling". This should be step 1... "[determine what] your company need[s] from the data" and "start developing a data governance program" must proceed the implementation of a technological solution." I actually take exception to the word "control". It's a controlling mindset that gives Data Governance a bad name (or any other form of governance, for that matter). We're there to facilitate, encourage, enable, mentor. To help people make sense of their information, in context, and assure that the end result (in relation to data) fits with the organisation's overall objectives. "Alan - that's a fantastic analogy (and one I might use myself in future)! I agree with you about the control piece - I was reading another article on LinkedIn yesterday about beaurocracy, and how it's got a bad name now precisely because of that controlling mindset. Agility, flexibility is key, but so are standards and proper processes. My dad taught me early on in life that you have to know the rules before you break them. I think that works well with governance. Know the rules, but know that they don't necessarily apply in all situations. So be able to deal with those exceptions by building exception management into the process. And don't get too precious about sticking to a process that clearly doesn't work - but don't abandon the idea of process either. Just keep tweaking until the right process can be found." "Alan and Emma, I couldn't agree more about the term "control", its connotation, and its implementation in many organizations. If we see this, why don't others? One thought is... control is what is taught in business schools. My wife is a business management professor. She taught me that the four principles of management, as they are taught in many business schools today, are Plan, Lead, Organize, and Control. She and I both agree that "control" is wrong, its "govern" that should be the fourth principle. But what does it mean to govern? What is it's value? In my view, the goal of governance is not to control, but to provide a framework within which to operate, to keep entropy at bay (important), while at the same time maintain insight into what is going on (more important). We actually created such a framework that we use with clients to help re-set their view of governance. It borrows from the architecture the founders of the USA set-up; rule makers, rule interpreters, and rule enforcers. You need all three, and it has to be balanced, but above all, you need authority with accountability (crucial). Authority without accountability leads to bureaucracy. Accountability without authority leads to frustration. Either one without the other results in ineffectiveness." "I would add the word "Contribute." Master data management is all about sharing data between your business units. Unless the people/organizations who originate the master data see the value in contributing that master data to the MDM hub with the purpose of sharing it with others in the enterprise to the benefit of the business overall, then it won't succeed." "Culture (Cultural Change really, not sure if I would score double points or be penalised for stating two words). Co-Creation (surely double points here). Clarity"
I suggest "Continuous", "Cyclic" & "Comprehensive" as additions to ensure a successful DG initiative. Some of the other suggestions are a bit Controlling and Condescending (pushy and paternalistic). Hi Alan. How about CULL? Good governance, as in civil society, should stick to what needs to be governed. How would we feel if EVERYTHING was governed. Short retention periods on the information we don't need to govern would let people do what they need to in the way they want to, EXCEPT in matters that ought to be governed.